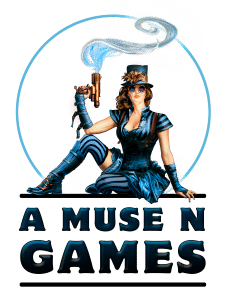 Starting Thursday July 2, from 6pm to 10pm the Pathfinder Society is invading A Muse N Games! Create your PFS account. At your first game, you’ll be given a unique PFS number. Use this number every time you play a game to track your progress online. Once your account is made, the sessions you have played will be posted online once reported by the store coordinator. In Pathfinder Society, your character has a myriad of resources available. The online resources, such as the Pathfinder Reference Document or PathfinderWiki provide all you need to add flair and flavor to your character. You can also learn more about your characters faction and interact with other members of the Pathfinder Society on our messageboards. This page contains links to various free downloads as well! Each one is designed to help you, the player, engage in Pathfinder Society Organized Play and keep up to date with the world of Pathfinder Society. Want to know everything to is to know about Organized Play? Within the pages of the guide you will find all the information you need to bring your Pathfinder character to life. The Guide to Pathfinder Society Organized Play is regularly updated to include the latest information for each new season. Your character belongs to one of 7 factions. Choosing your faction is as important as choosing your character’s class or race‚ it defines your character in the campaign, and ties her to the destiny of one particular cause. Before you choose your character’s faction, consider each carefully and pick the faction that best matches the character you are trying to create. Some classes may be harder to play in some factions than others. Learn more about each faction and interact with other characters. These Faction Journal Cards a great new way to contribute to your faction’s goals while also being able to experience the fun of factions in any adventure—even sanctioned Modules and Adventure Paths. Included is a sheet with instructions for how to use the Faction Journal Cards and 7 total cards for all of the factions (Dark Archive, The Exchange, Grand Lodge, Liberty’s Edge, Scarab Sages, Silver Crusade, and Sovereign Court). Each double-sided card includes a brief summary of the faction’s aims, several unlockable rewards, and a wide variety of tasks the character can complete in adventures from any season of Pathfinder Society Organized Play. This is a specific list of Paizo Publishing products and the equipment, traits, deities, spells, feats, and classes contained within that are legal for play in Pathfinder Society Organized Play. While most of the Pathfinder RPG Core Rulebook is legal for play (with some feat and spell exceptions), these additional resources give you new character options. If a product does not appear on this list, then it is not considered legal for play. This list will be updated frequently as new products are released. In order to utilize content from an Additional Resource, a player must have a physical copy of the Additional Resource in question, a name-watermarked Paizo PDF of it, or a printout of the relevant pages from it, as well as a copy of the current version of the Additional Resources list. (If you’re bringing a printout of the pages, it must be from the Paizo PDF and not text copied and pasted into a blank word processing document). Since the core assumption for Pathfinder Society Organized Play is the Pathfinder RPG Core Rulebook and Guide to Pathfinder Society Organized Play, we cannot assume that every Game Master will have the products listed below. As such, it’s up to players to bring these items in order to familiarize their Game Masters with the rules. The Community Use Packages include all kinds of symbols, artwork, and other free resources that you can use for your character. Remind fellow players (and your GM!) who you are and who you’re roleplaying at the table with this free table tent sheet. The PathfinderWiki is an unofficial community use project that compiles canon elements from the Pathfinder Campaign Setting. This is a valuable resource for finding out more about the world of Pathfinder, or as a way to help build your character’s background and role in the Pathfinder Society campaign. Keep up with the latest news and information in Pathfinder Society every Monday. Warhorn is an organizational site where you can book your seat for Pathfinder Games in advance, and see what games are currently being offered.